Tiles or Slabs for Countertops? Granite countertops continue to be a favourite among homeowners in Toronto who spend a lot of time in their kitchen. However, with the availability of Granite tiles, new homeowners looking to remodel their kitchen are confused whether to choose them over conventional slabs. Granite slabs and granite tiles look very similar at first glance. However, the similarity ends with the appearance. There are many differences in the two and the first difference is the cost. Granite tiles are almost 50% less expensive than granite slabs. So, if your idea is to be as thrifty as possible with your budget, then you may consider tiles for your kitchen countertop. However, installing granite tiles may take up to 3 times longer than conventional slab countertops. This translates into additional installation cost. Anyone who fully appreciates the benefits of having a durable, beautiful and low maintenance countertop material, would vouch for granite slabs. They are easy to install and once installed, they are extremely easy to maintain. Granite tiles on the other hand have a cumbersome installation process and despite the most experienced and skilled craftsmen working on it, there may still be grout lines to show. These grout lines must be meticulously cleaned on a timely basis. Granite tiles have a lot of grooves and pores which can be a haven for dirt, grime and food particles. And this means that it can also be a germ magnet. If your kitchen is your hub for entertainment and a lot of people use it, then your goal must go beyond the aesthetics. You’d be looking for a countertop material that’s easy to clean. Granite tiles need to be scrubbed to get it clean, making it a high maintenance choice for the kitchen countertop in your Toronto home. On the other hand a granite slab can be wiped with a microfiber cloth and some water. Viola! It’s as good as new again. It does not absorb water or food particles and has a high resistance to heat and scratches. 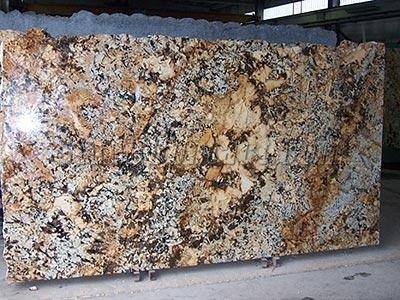 If you have seen granite countertops in design magazines and online portals, then you must have been awed at the seamless flow of the large granite slab that is separated only by the corners. A similar look is impossible to achieve with granite tiles. And if you are a DIY person, then the installation can quickly go wrong if the surface is uneven. All these factors make granite slab the ideal choice for your kitchen countertop in Toronto. You can however, use granite tiles in other areas of your home which is not used as much as the kitchen. The bathroom and the outdoor barbeque area are good places..